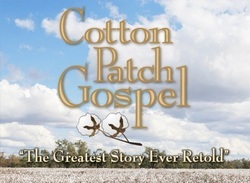 The musical, “Cotton Patch Gospel” returns to the stage for one performance only on Sunday, January 20th, 6 PM at the Quaker Gap Baptist Church, 2265 Flat Shoal Road in King, NC. The “Greatest Story Ever Retold” will be performed in this two person adaptation by John and Beth Chase. The script was written by Tom Key and music written by Harry Chapin as inspired by Clarence Jordan, the author of the Cotton Patch Gospels. Jordan's adaptations of the Gospels combine power, depth and humor in a remarkable telling of the gospel narrative to a modern day audience for all ages. Sponsored by the mission committee of Quaker Gap Baptist Church, this performance will be a community benefit for the King Outreach and East Stokes Ministries of Stokes County. Admission is free; donations will be accepted during an offering at intermission. So, bring your friends and family to enjoy this evening together. If you have any questions or need assistance contact QGBC @ 336-994-2117.